David Donde: Where is the world’s best coffee from? Which country grows the greatest coffee? There is a question that if I got a penny for every time I was asked it, I’d have a least a pocketful of copper. I’m not going to digress into the copper price at the moment, but to explore the great coffee regions of the world. First off. Italy. You know what coffee they grow? Nada. None. Not a solitary bean. Coffee grows in the tropics. Even the subtropics. In terms of volume, there is a clear winner. In the words of the great Sinatra, there’s an awful lot of coffee in Brazil. The greatest? Yes, if one measures by volume. But one should never measure by volume. Quality over quantity any day. Should we turn to price then? Perhaps Indonesia with itss famous civet cat crap coffee, known by bucket-listers as Kopi Luwak? Sadly, its taste is reminiscent of the production process. Perhaps the gentle, chocolate-y sweet overtones of the top expressions of Guatemalan terroir? Certainly good enough to settle a solid second on my list of producing countries. For the ultimate coffee experience, however, I am delighted to point out that one must return to the birthplace of coffee. My favourite place of origin. Now Ethiopia produces exceptional coffee, with each region having unique and distinctive flavours present and easy for the palate to identify. Take Yirgacheffe. Citrus verging on pineapple-ness with high acidity. Yum, but hectic. Sidamo, Heavy and deep, full bodied, thick, sometimes syrupy. But for me, there can only be one. Harrar, a micro-region. In a good year, and it does not happen every year, one gets a taint, similar to botrytis in sweet wine, that produces something special. A burst of blueberry layered on heavy, intense deliciousness. For me there isn’t a greater coffee. 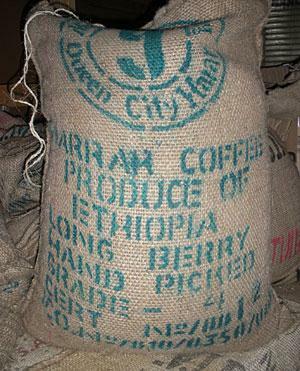 Or a greater origin, than Harrar, and that puts Ethiopia at the top of my list. Every time. David Donde is the guy behind Truth Coffee in Cape Town.